Last week the ETHUSD pair was in a bearish trend. The bulls reached a high of $185.64 and were resisted. 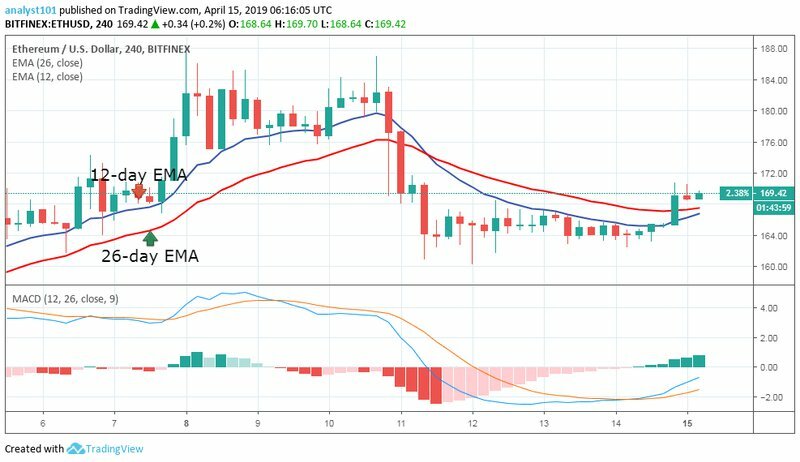 On April 8, the crypto’s price made a downward correction to the support of the 12-day EMA. 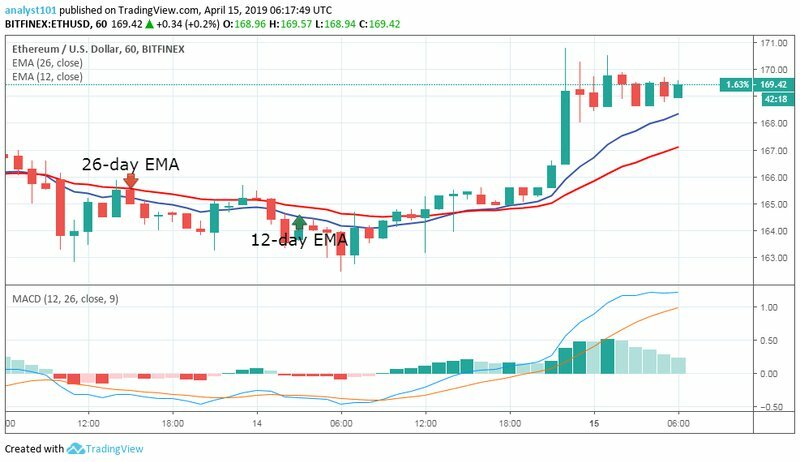 On April 10, the bulls could not sustain the price above the EMAs and the bears broke the 12-day EMA and the 26-day EMA to the bearish trend zone. The price fell to the low of $165.21 and commenced a range bound movement. The crypto’s price is below the EMAs which indicates that the price is likely to fall. On April 14, the bulls break above the EMAs to reach the high of $170.32. On the upside, if the bulls sustain a price above the EMAs the crypto’s price will rise to retest the $184 resistance level. On the other hand, if the bulls fail to sustain price above the EMAs, the crypto’s price will fall to resume a downward trend. Meanwhile, the crypto’s is above the 12-day EMA and the 26-day EMA which indicates that price is in the bullish trend zone. However, if the bears break below the EMAs, the crypto’s price is likely to fall. Meanwhile, the MACD line and the signal line are above the zero line which indicates that the price is in the bullish trend zone.